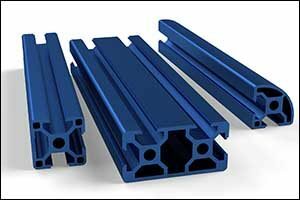 One of the most common alloys used in custom extrusion design is the 6000 series. At Silver City Aluminum, this is the aluminum alloy group that we use to provide the most benefits of aluminum products to our customers. Aluminum industry solutions are designed to be strong and stable while offering just one-third the weight of steel. 6000 series aluminum alloys are heat treatable, which makes them very easy to extrude and weld, if necessary. Custom designs help to reduce the amount of post extrusion operations that are required, making improvements to the natural corrosion resistance of aluminum and boosting strength where it is needed. Parts, products, and components created with 6000 series aluminum are strong enough to use in load-bearing applications and are medium to high strength, perfect for use in marine and construction environments. Manufacturers can use either a hot or cold extrusion process for aluminum industry solutions, which is somewhat similar to other types of metal extrusion. At Silver City Aluminum, we use a hot extrusion process with our 6000 series aluminum alloys. To form the raw aluminum billets into the profiles required by the customer, our team heats the proper size stock aluminum to a specific temperature before pressing it through a steel die at more than 10 million pounds of pressure. A die, which is also sometimes called a profile, is created by our team of experienced engineers and the customer to create a desired finished shape. Once the pieces are created through the extrusion process, they are stretched and cooled on special tables and then cut according to the customer’s specifications. Additional enhancements are also done, including deburring, anodizing, painting, powder coating, or assembling, based on the exact needs of the project. Our engineers assist customers in custom extrusion design to help them maximize the return on their investment, providing all of the benefits of aluminum products that are available through this process. Our many years of experience working with custom extrusion design and post extrusion operations gives us the unique ability to consult with customers and help them get the best results. More and more industries are choosing to work with aluminum materials because of the benefits that they provide. Some of the benefits of aluminum products are directly related to the manufacturer or industry that they serve, while others create advantages for consumers or other end users of the finished product. Aluminum is extremely strong, resistant to corrosion, lighter in weight than steel, and is tolerant of a wide range of temperatures. This makes a perfect solution for most industries, even those who serve users in extreme environments or climates. Aluminum is 100 percent recyclable, and at Silver City Aluminum, we use billets that are made of 99.9 percent recycled materials, offering a truly sustainable solution to our customers that they can be proud to use. When designed with sustainability and waste-reduction in mind, custom extrusion design will require very little machining and post extrusion operations, reducing the carbon footprint of the products, parts, and components even further. There are many benefits associated with using custom aluminum manufacturing that can be used to advance your industry, products or brand into the future. Regardless of the industry that you serve, quality matters. Choosing the right manufacturer makes a big difference in the quality and value of your aluminum industry solutions. We have worked to earn a solid reputation in the aluminum extrusion industry and have developed strong relationships with many of our customers, as we continue to work with them and serve their needs for many years. Our team of highly trained, skilled, and experienced engineers, designers, and technicians works with each customer to ensure that we meet or exceed their expectations on every order that we complete. If you are interested in learning more about the benefits of aluminum products or would like to talk with one of our team members about your ideas for custom extrusion design, give us a call at 508-824-8631. We can answer any questions that you might have about aluminum alloys, post extrusion operations, and custom finishing options to help create aluminum industry solutions that are right for you and your unique specifications.